Papaver somniferum, the opium poppy, is the species of plant from which opium and poppy seeds are derived. Opium is the source of many drugs, including morphine (and its derivative heroin), thebaine, codeine, papaverine, and noscapine. 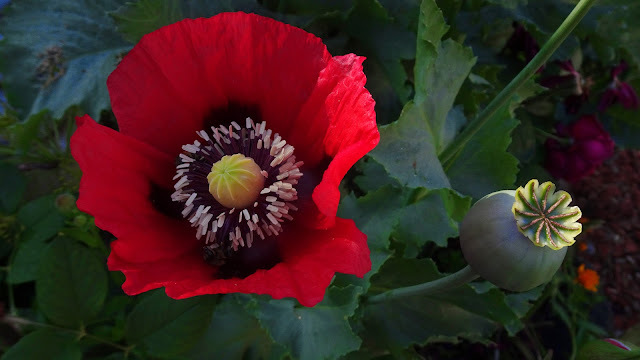 The Latin botanical name means the "sleep-bringing poppy", referring to the sedative properties of some of these opiates. The opium poppy is the only species of Papaveraceae that is an agricultural crop grown on a large scale. Other species, Papaver rhoeas and Papaver argemone, are important agricultural weeds, and may be mistaken for the crop. This poppy is also valuable for ornamental purposes, and has been known as the "common garden poppy", referencing all the group of poppy plants. Poppy seeds of Papaver somniferum are an important food item and the source of poppy seed oil, a healthy edible oil that has many uses. Poppies in november - almost historical.